There are only two basic stitches in knitting. One is the knit stitch, and the other is the purl stitch. Learning how to knit both of these stitches, will allow you to follow most knitting patterns. While it might feel awkward knitting at this stage, if you take it slowly you will soon gain speed. To practice the knit stitch, all you need is a pair of knitting needles and a ball of yarn. You can use any size needles you like to practice, but make sure that the needle size is appropriate for the type of yarn you are using. You can find the recommended needle sizes for different types of yarn by checking the yarn label. Casting on is how you begin every knitting project. 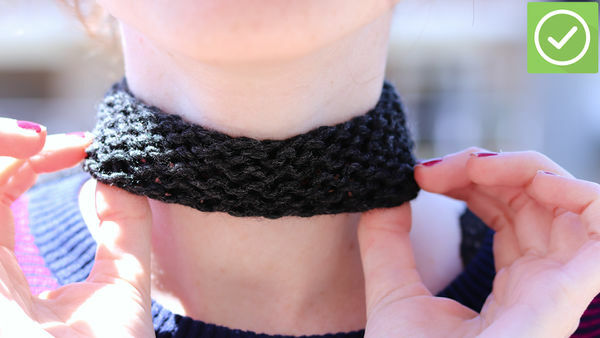 Start by looping the yarn around your finger twice and then pull the back loop through the front loop to make a slipknot. Then, slip the slipknot onto the needle in your non-dominant hand. Loop the yarn around the needle and pull new yarn through it make more cast on stitches. If you are following a pattern, then cast on the number of stitches that the pattern specifies. If you just want to practice the knit stitch, then cast on 10 stitches. You should hold the needle with the cast on stitches on it in your non-dominant hand and the other needle in your dominant hand. Hold the needles near the points for better control of the knitting motion. Place the needles so that the right needle crosses behind the left needle. Then, insert the tip of your right needle into the back of the first stitch on the left needle. When working the knit stitch, it is important to always go in through the back of the stitch. Your working yarn should always be behind the needles while you knit, so position it this way if it is not already behind the stitches. Wrap your working yarn around the tip of the back needle, so that the yarn hangs between the two needles. This yarn will form your first new knit stitch. 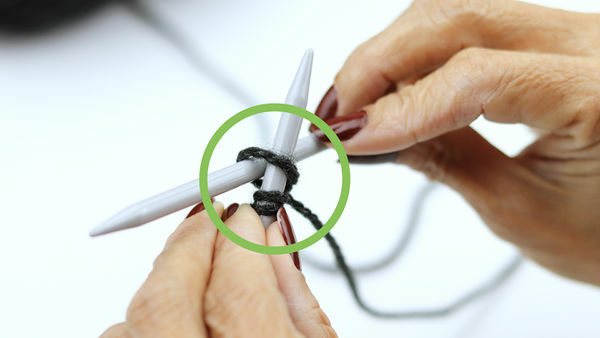 If you are right handed, then you will loop the yarn around counterclockwise. If you are left handed, then you will loop the yarn around clockwise. Use your non-dominant hand to hold the free end of the yarn and ensure that the loop is secure. Then, pull the tip of the right needle gently back through the first loop towards you, bringing the yarn with it. Let the old loop slide off the end of the needle. Keep the yarn taut after each stitch to keep the loops close to the needle but not so tight that you can't slide the needle into the loops. Be careful as you slid off the cast on stitch. 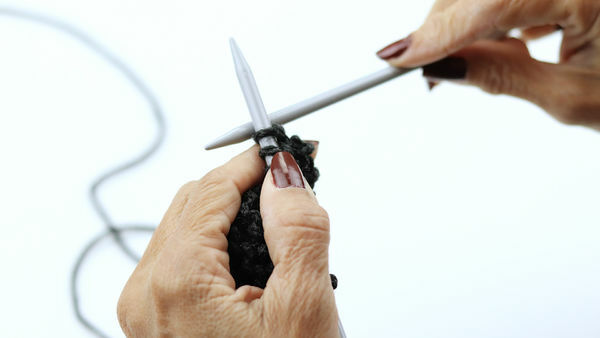 Make sure that only the stitch that you knit into comes off. You should have one new knit stitch on your right (dominant hand) needle. Repeat the process to knit the other cast on stitches. When all of the stitches are on your right needle, you have finished your first row of knitting. You can continue knitting your other rows in the same way until you finish your project or until you feel like you have mastered the knit stitch. To knit the second row as well, you do not have to reverse the movement. 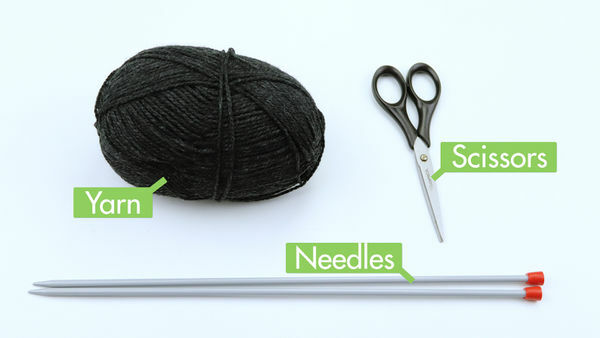 Simply switch the needle with all of the stitches on it over to your non-dominant hand again. You are now ready to start knitting your second row in exactly the same way as you did the first row. This produces what is otherwise known as the garter stitch. If your pattern calls for the garter stitch, then you will simply need to knit all of the rows. Once you're skilled at knitting the knit stitch, you will find it becomes second nature and you'll be using it to make garments, accessories and much more. Practice the knit stitch until you feel comfortable using it.